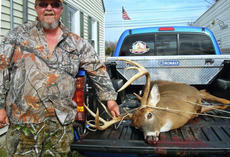 Dale Lewis of Buffalo harvested this 10-point buck with a 300 mini mag rifle during Modern Gun Season in November. The deer weighed 200 pounds. Kelly Flanders of LaRue County was one of 15 people honored at theCommonwealth of Kentucky Governor’s Office of Agricultural Policy conference earlier this month. 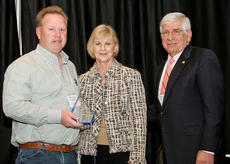 Flanders, the owner and operator of R&K Angus Farms in Buffalo, was named Outstanding County Council Member from Extension District 5. The award was presented by First Lady Jane Beshear and GOAP Executive Director Roger Thomas to outstanding agricultural leaders who have played a role the past two years in helping continue the important initiatives of the Kentucky Agricultural Development Fund. Native son Abraham Lincoln’s 202nd birthday is celebrated this week. Born on a farm here in LaRue County, Lincoln had a significant impact on LaRue County and American Agriculture. Raised on farms in Kentucky, Indiana and Illinois, young Lincoln obviously did the farm chores of feeding livestock, planting seeds and weeding that all pioneer farm boys did. Even his famous rail splitting abilities were related to clearing the land for farming. Ray DeSpain plans to demolish an old barn on his farm at the edge of Hodgenville city limits. DeSpain shared a few memories about “corn shredding” in that old barn. As a few oldtimers may remember, corn shredding was not a one-man job. Six men, at a minimum, were needed. Eight was better and 10 were too many. First, the old shredder had to be positioned at just the right spot to blow the shredded corn fodder in the loft of the old barn and to drop the ear corn in a parked wagon. In last week’s column we looked at some reasons to renovate pastures (seed legume such as clover into existing grass stand). Let’s look at some more reasons for this practice. Renovating pastures reduces nitrogen fertilizer expenses that typically account for 20 to 40 percent of the cost of producing forages from grasses. Typically, depending on the cost of nitrogen fertilizer, legumes can put from $18 to $100 or more worth of nitrogen into the soil. This more than offsets the cost of renovation. The USDA Forest Service Southern Research Station is distributing free copies of a new guide, titled “A Management Guide for Invasive Plants in Southern Forests,” that gives homeowners, gardeners, land managers and others information on controlling and removing invasive plants in the South. Natural Resources Conservation Service in Kentucky is accepting applications for the Grassland Reserve Program. Although GRP applications are continually accepted, the application ranking cutoff date for 2011 is March 31. Applications received after March 31, 2011 will be deferred until the next ranking cycle. The LaRue County Conservation District will accept requests for cost share funding under the Kentucky Soil Erosion and Water Quality Cost Share Program through Feb. 28, 2011. Nancy Bell Raine was born on a farm on Stiles Ford Road. Her father, George Bell, bought the farm from S.C. Cessna on April 2, 1909. It is now owned by Eugene Allen. Nancy thinks the old barn that is still on the property was there when her father purchased the farm. If so, it is more than 100 years old. The barn is somewhat unique because of the drive-in loft. Allen said, in years past, he has backed his wagon loaded with bales of hay into the loft. That beat hoisting the hay up to the loft with the wagon parked on the ground. Renovating pastures and hay fields to renew grass productivity is one of the most important things LaRue County farmers can do to improve the grassland grazing and hay land in the county. Pasture and other forage lands in LaRue County feed the county's 28,000 head of cattle and calves in addition to the other ruminant livestock and horses. Believe it or not, pasture renovation time will soon be here.